Endoscopy has been in practice for many years in diagnostic medicine. From a simple image collection device, the endoscope has grown into an instrument that incorporates multiple imaging modalities to extract structural and functional information from different parts of the human body. Concise, yet comprehensive coverage of various endoscopic forms as provided in this book is expected to help the reader to generate new knowledge in this field. 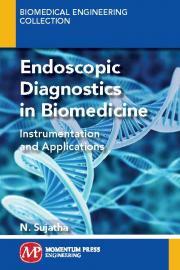 Multimodality endoscopes are discussed in detail in this book, along with their clinical applications. The book is intended for graduate-level students as a quick reference to understand the evolving trends in endoscopic design research. The challenges that remain unaddressed could potentially be explored by biomedical researchers to advance this technology to realize the concept of optical biopsy during routine endoscopic examinations. The book portrays the endoscope as a purely optical instrument, and hence hybrid modes of endoscopic imaging are not covered. N. Sujatha obtained her PhD in biomedical optics from Nanyang Technological University (NTU), Singapore. She is currently professor of biomedical engineering in the Department of Applied Mechanics at the Indian Institute of Technology Madras, India. She was associated with NTU Singapore during 2014–2015 as visiting associate professor, School of Chemical and Biomedical Engineering. Her major research interests are in laser-based diagnostic imaging and diagnostic optical spectroscopy.